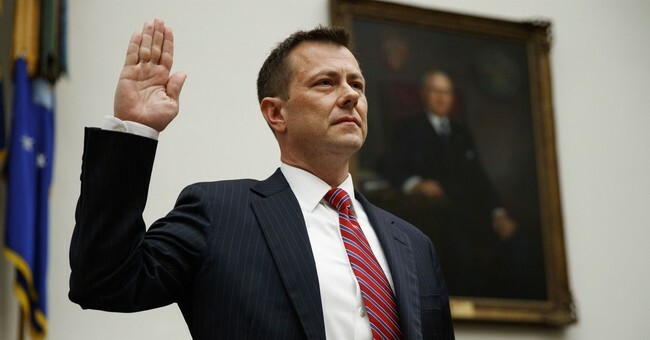 During a joint House Oversight and Judiciary Committee hearing Thursday morning, Democrats loudly cheered on disgraced FBI agent Peter Strzok for taking on President Trump. Strzok is under fire for having an extreme anti-Trump political bias while working on the Special Counsel investigation and the criminal investigation into Hillary Clinton. Considering Democrats agree with his motivations, not to mention the way he classified Trump voters as uneducated, smelly and bigoted in text messages to his mistress, the cheers aren't surprising. Democrats obviously entered this hearing with a pre-planned disruption campaign. Meanwhile, FBI counsel tells Strzok not to answer questions. Almost seems like some people don’t want information to get out. Wonder why that is? Meanwhile, Judiciary Committee Chairman Bob Goodlatte told Strzok he will be recalled after the hearing and considered for contempt charges. "At the conclusion of the day, we will be recessing the hearing and you will subject to recall to allow the Committee to consider a contempt citation," Goodlatte said.